Less than a year ago, Abi Noall gave up a career in management to pursue her dream of making luxury chocolate cakes, here in Plymouth. Now her new business, the aptly named My Fabulous Cakes is showing signs of sweet success. However, her school careers advisor steered her away from a career as a chef. After being told that she was “too bright to be a chef” Abi was pushed into a management career where she spent much of her working life. It didn’t stop her keeping one foot in the catering world though. “I dabbled in chef jobs interspersed with management stuff, even did some part time cake making over the years, relishing every opportunity to create something new for friends and families’ special occasions. What occasion is complete without a cake after all?” says Abi. However, it was in the kitchen where she felt she truly belonged. The chance came during a tricky patch in her personal life, and Abi decided that if she didn’t pursue what she loved now, she might never do it. She left her full time job, hired some builders to give her kitchen a makeover, and My Fabulous Cakes was born. Most new businesses agonise for months over their choice of business name. This time, the perfect name came about by accident. “Whilst I was still employed I’d decided to upload some photos of my cakes onto my personal Facebook page. I’m very backward in coming forward so this was a big deal for me. However, I was particularly proud of these cakes that I’d photographed, so I named the photo album My Fabulous Cakes” says Abi. The response was immediately positive. It proved to be the push she needed to take her cake making seriously. Emboldened by the response, Abi decided to adopt the name, and her new business start-up began trading. One of the most common problems shared by new business start-ups is the lack of a clear USP. My Fabulous Cakes doesn’t suffer from this problem, Abi is clear about what differentiates her business. She specialises in only making chocolate cakes. High quality chocolate cakes. You won’t find any buttercream or dry sugary sponges here. 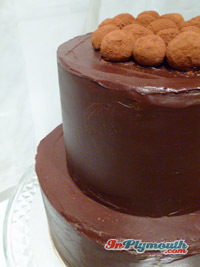 She bakes with dark chocolate that contains over 50% cocoa solids, and chooses her recipes carefully to ensure that her cakes provide a taste experience that is unique. My Fabulous Cakes began trading at Plymouth City Market on 18th May 2013 but footfall was low and Abi didn’t sell much. However, she met another trader there who took Abi under her wing and gave her some useful contacts and a lot of advice. On her advice, Abi decided to try trading at an event: the Lamb Feast at Plympton St Maurice in mid June. Armed with a new gazebo, made it in time for a massive downpour of rain just as she began to erect the gazebo. The event opened at noon and finished at 5pm. However by 3pm My Fabulous Cakes had sold out of every last cake and taken 10 times more than at the City Market. She filled her diary with big events and food markets, stopped trading at the City Market, and focused on finding more suitable markets for her luxury cakes. Less than a year later, My Fabulous Cakes is trading at regular producer markets every weekend. Five of her bestselling lines are currently being shelf-life tested at Duchy College with a view to selling wholesale as well. Business start-ups almost always struggle with pricing. Like many new businesses, Abi started off by undercharging but is now restructuring her prices. The most common customer feedback she had been getting was about how cheap her cakes were. The obvious thing to do was listen to it and price her cakes accordingly, and her customers seem to agree because sales are going up. “I’m excited about the future of My Fabulous Cakes. I sometimes wish I’d done this many years ago; but perhaps the time is right for me now.” says Abi. You can find out more about My Fabulous Cakes on their website or on twitter (@myfabulouscakes). We created the Start-up Stories section to help promote entrepreneurship in Plymouth. If you would like your business to be considered for our Start-up Stories section just complete the form in the sidebar or send an email to startupstories@inplymouth.com with some brief info about your business. Your business has to be less than 12 months old, local to the Plymouth area, and share our desire to promote Everything Good in Plymouth. We reserve the right to reject any applications that we feel are not suitable.